A practical guide for prevention and treatment of back injury, pain and more. This kit serves as a practical back owners' guide. Ideal for workers in all settings, as well as for people with back problems, as an easy way to help them prevent or recover from back injuries. Topics includes all aspects of back health, including basic anatomy, illustrated exercises and stretches, proper lifting techniques, prevention and treatment of injury, pain-relief and more. What Makes a Healthy Back? 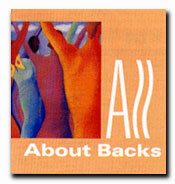 Back Facts-How Much Do You Know? Who's in Charge? Is Back Pain Controlling Your Life? Chronic Low Back Pain: Can You Reduce Your Risk?